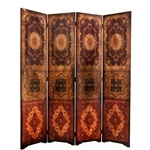 Shop our large selection of over 200 different room divider screens. Room dividers can be used to separate your living, dining or bedroom space from the rest of your studio apartment or multipurpose room in your home. Because urban dwellings tend to be smaller, decorative folding screens can divide and define your living space as well as create privacy. 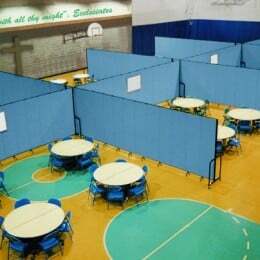 Folding panel screens can be used to define or partition off areas in large venues such as banquet and catering halls as well as other institutions. If you have overnight guests staying in your living room or common area, decorative screens can be used to provide privacy from the rest of the space. 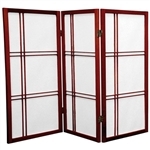 The beauty of these folding screens is that they are lightweight, portable, functional and inexpensive. They make great corner accent pieces as well as attractive backdrops behind sofas or used as a headboard. Our art and photo printed screens deceivingly look expensive, yet are surprisingly affordable. Use them for your business as attractive window displays for retail stores, visual merchandising props, photo backdrops, or theme decorating for parties. The visual impact these screens have on people is amazing! Inexpensive portable mechitzah,(mehitzah, mechitzah) partitions for shuls, or religious institutions. Where to buy or find room divider screens? Don't waste your time looking for room dividers in stores because you will find a very LIMITED selection. Exclusively sold online, Urban Accents NY features a large selection of folding room divider screens in all sizes(3ft,4ft,5ft,6ft &7ft tall) and styles. Choose from three to ten panels to cover large spaces. If you are looking for a simple cheap room divider without cool art print images, we offer a $59 industrial strength corrugated cardboard privacy screen. Find a large selection of rattan, fabric, faux leather and wooden folding screens in all sizes. 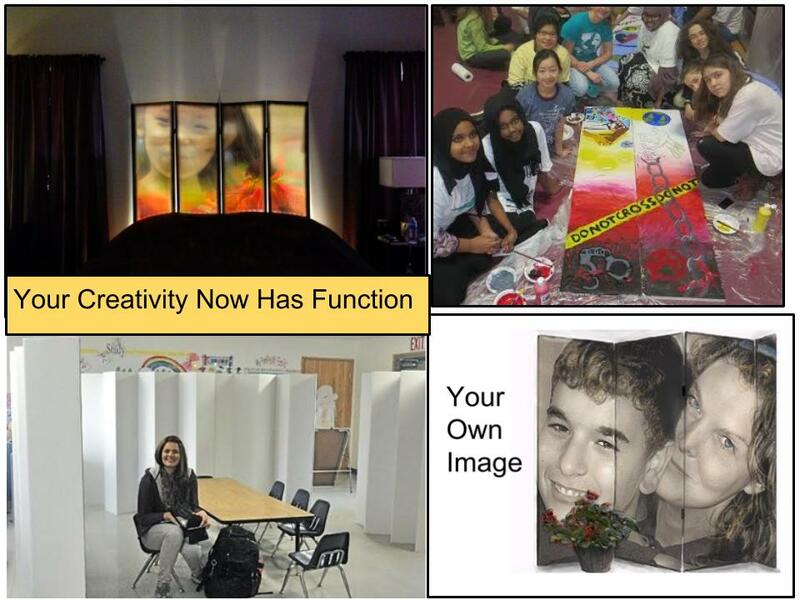 If you are feeling creative, check out our "do it yourself" section from our blank canvas room screens. If there is an artist within you, why not diy? Get excited and let the ideas flow! We have a large selection of world famous photography and impressionist paintings by artists such as Monet, Degas and Da Vinci. 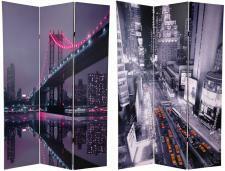 These 3,4,5 and 6 panel art print room dividers are double-sided with a different image on each side. Stunning photography of various themed subjects from western, vintage, nature, animals, landscapes, travel posters, children book illustrations, TV shows like Star Trek, Simpsons, Hello Kitty, and more. Now retail stores have an inexpensive way to really enhance their displays on their showroom floors by using decorative themed folding screens.These unique props are perfect for window dressing for displays. They can also be used near the counter to enhance the shoppers for impulse buys.Visual merchandising is made easy with the aid of these big and bold functional in-store props. There are many themes to choose from to enhance the decor and design of your store. These are the hottest thing in commercial interior decorating. 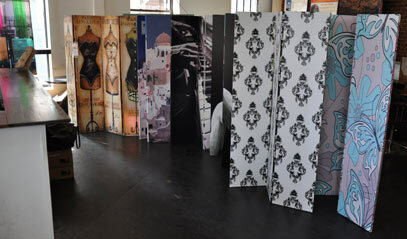 Clothing boutiques can use these dividers as decorative dressing screens for customers. Stores and businesses can use our "nature and outdoor" themed screens for summer, winter, fall and spring to use for seasonal sales. Customers will remember your business due to the large scale of in-store signage. If you are wondering how to make cheap window displays, these room dividers are portable functional pieces of art that visually stimulate customers to buy more merchandise. Art supplies stores do not carry double sided lightweight canvas screens like the ones you see on this site. 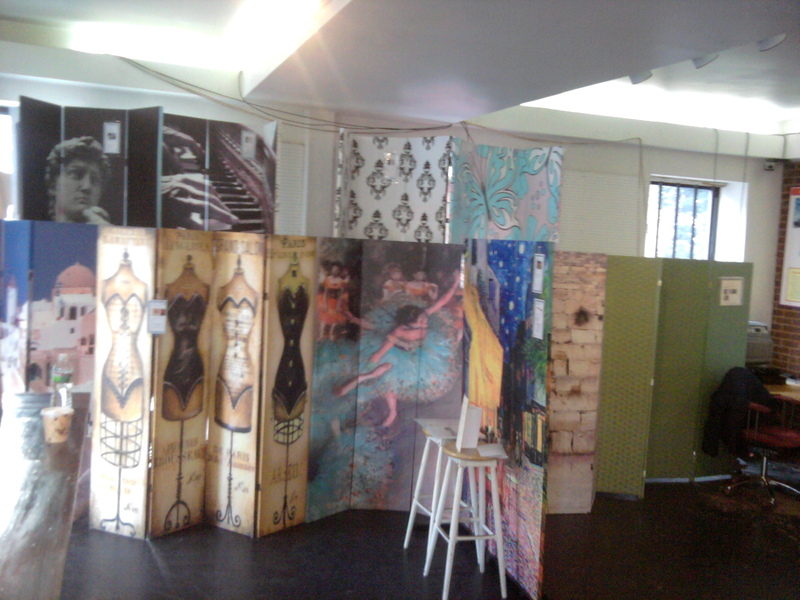 We offer blank canvas screens in different heights and panels. 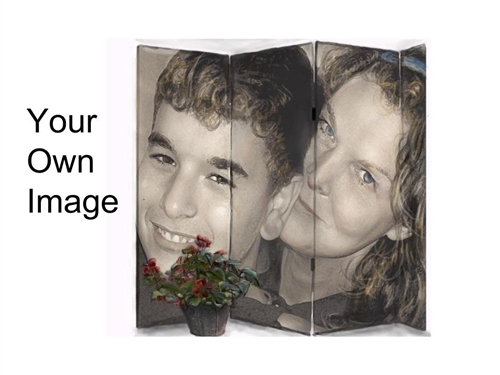 Now you can be creative and paint, stencil, decal, wallpaper or sketch your designs on a functional canvas screen. The beauty of these screens is that it saves time from trying to find raw materials to create a folding screen. These DIY (Do it Yourself) panel screens are competitively priced. Professional and amateur artists can make their art functional and mobile rather than wall mounted. Get your creative juices flowing. This would be a great way to bring the family together. 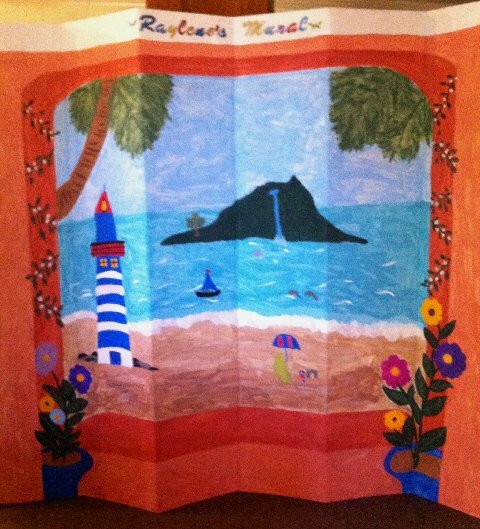 Here is an example of how a mother and daughter painted our $59 cardboard room divider. Now you can not only “divide” a space but you can also make a bold decorative statement with these unique room screens or dividers. You will find that these art print room dividers make a great conversation pieces. Your friends will compliment you by saying, “wow, cool room divider, where did you get it?” And if you are traveling to a trade show where you need a privacy screen that is portable, these decorative folding screens are perfect for people on the go. 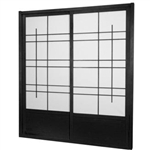 We also offer a wide selection of Japanese style shoji screens in multiple finishes and heights. If you are looking for non-art print screens, click the category "regular room dividers". Here you will find folding screens that are2ft,3ft,4ft, 5ft, 6ft and 7ft high. Keep in mind the standard height of these screens measures 6ft high. We are all familiar with wall posters. These art print room dividers are the step up from your juvenile and college day posters. Some of these enlarged images can be recognized in many places, framed or simply and cheaply taped to the wall. Now you can have that same iconic image tastefully enlarged on a functional screen which can serve as a room divider, corner accent piece, enlarged photo back drop or it could even be mounted to a wall as art. Traditional rice paper Japanese sliding doors stand 7ft tall and come with a track system kit to mount in front of door-less entry ways. Perfect for railroad layout apartments, where the floor plan is narrow and one must enter multiple rooms with no visible partition, these sliding doors allow for light to pass through while at the same time create sufficient privacy and have a nice decorative look. "My small congregation of around 30 families had to relocate temporarily because of an asbestos problem in our church building. We were fortunate to find a social hall in a community center where we held services and Sunday school classes. I ordered five of the 7ft tall 8 panels in blank canvas for our Sunday school students to post their art projects. 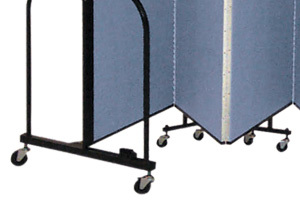 These folding screen panels are lightweight and easily portable." "I own a vintage clothing store in Dallas and I wanted to add some show room props to give it more of a vintage theme to the store. 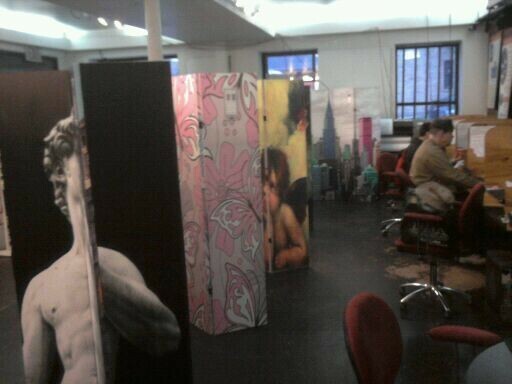 I found a huge selection of vintage art on a 6ft folding screen room divider. I purchased 4 different screens from the vintage category on the website and I get tons of compliments from customers as well as asking me where I got the room dividers from?" "My large living room in my Victorian home was so big that it needed to be divided into a play area for my 8 young grandchildren when they come to visit me for the holidays. Since the decor in the room is black lacquered wood I needed to find a room divider that matched that. I found a six panel venetian shutter room divider in black that fits perfect in the living room." "Since my karate lesson enrollment doubled since last year I had to hire another instructor and hold both adult and children classes at the same time, I needed to find a solution to divide the space. 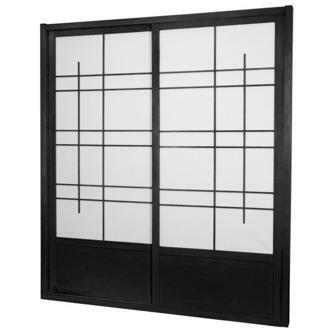 I purchased on the website an 8 panel shoji screen, I love the Japanese rice paper window pane pattern, which was the cheapest and most functional solution." "There is this big bay window which the sun shines through and blocks the TV with the reflection. I bought the $59 cardboard room divider to place in front of the window to block the sun light from coming in. Also helps keep the room cool during the summer. "I am a full time party planner and I often have to plan the theme decor of the given venue. The folding screens on this website are perfect, portable and light weight to set the theme of the party. I also use them as backdrops where the guests sign in towards the entrance." "I have twin boys that share the same room and they are now turning 15 and need some privacy. They love Spiderman and I saw the new art print room dividers of Spiderman. I purchased the 6 panel one and they love it."